Inside Tracker will give you the most informative blood test you'll ever take. Is it worth $99? Blood tests are a drag. It's bad enough that you've got to wait around while a needle is lodged in your arm until your veins spill out enough blood to fill a handful of tubes. But the outcome can be just as painful. A week or so later, you receive a meaningless document with unintelligible results from your blood sample. A company called InsideTracker is trying to make blood test results much easier to understand -- translating mysterious numbers into a clear picture of your health. InsideTracker also provides you with specific actions you can take to get your health in order. InsideTracker was started by three MIT professors with credentials up the wazoo. But I get a lot of crazy pitches about technology that can improve your health, and I was incredibly skeptical that the company could tell me anything about my blood that my doctor hadn't already told me. Nevertheless, I was intrigued. I took the test last month, and the results were legitimately surprising. I try to live a healthy lifestyle. I know I don't get enough exercise, but I'm very thin. Though I definitely could eat better, I tend to mostly eat whole grains and vegetables. The one -- and only -- issue that has ever shown up on a blood test taken by one of my doctors is that I have very low Vitamin D (me and everyone else in New York). But InsideTracker found some other issues in my blood test. For instance, I had no idea that I have very low testosterone (insert joke here). The results on InsideTracker's website told me that I probably have low testosterone because I'm not getting enough sleep (yup), not getting enough exercise (check) and don't do enough strength training (that's an understatement). It also suggested that I eat more bran, lima beans, almonds and artichokes. So why did InsideTracker find that and not my doctor? Because they're looking for different things. While doctors screen me for things like leukemia and prostate cancer, InsideTracker looks for what co-founder Gil Blander calls "measures of health." "We're not trying to see disease, because there aren't many lifestyle changes you can make to change it," he said. "But we are screening for testosterone, because sleep and diet can improve it." I saw those results last month and said, "Huh, that's interesting." And, because I'm lazy, I then proceeded to go on not getting enough sleep or exercising. But a few weeks ago, I got to preview a new InsideTracker feature that went live on Wednesday: Inner Age, an attempt to calculate how old your blood results suggest you are. I'm nearly 32, but my "inner age" is 50. That scared me enough to do something about my health. 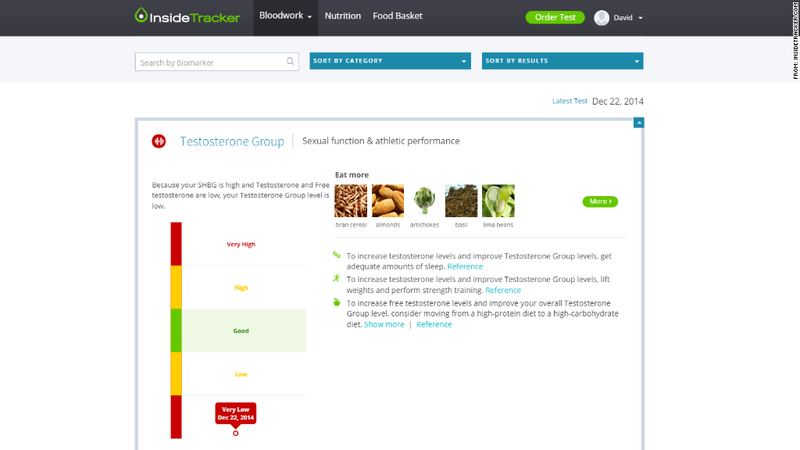 InsideTracker takes what it considers to be the five key measures of health (testosterone, glucose, vitamin D, hs-CRP and ALT). Those last two are a protein that puts you at risk of heart disease and an enzyme that can cause liver damage. The company measures your levels of each. Too high or too low, and you get years added to your age. If they're just right, you get years taken off. It depends on who you are. Blander said InsideTracker is going after two groups of customers: fitness geeks and people who are health-conscious (the Whole-Foods-shopping, gym membership types). They're not going after unhealthy people or folks who are in pain -- doctors are better suited to them. I'm not the type who would have bought this test. Even after taking it, I'm not sure I would fork over $249 for the results in the future. But I'm glad I have a clearer picture of my health, and I'm making an effort to live better.